This will be a conversion from commercial office to a 250 room upscale internationally branded extended stay hotel - a first for downtown Edmonton. More details to come in the coming months. Last edited by alambie; 03-02-2018 at 10:24 PM. Interesting. Definitely a great location. Short walk to the ICE district and a lot of great places for food and drink in between. I think there is demand for an extended stay hotel in the downtown, especially if it's a well known name brand. Good location for it no doubt. What kinda love do you think the tower will get? Anything street level? A reclad? Nice!!! This is exactly what the downtown needs! I hope the tower gets recladded. I think street level definitely needs improvment. Also would like to see a new glass roof with lighting if possible. Isn't that what the Coast Edmonton Tower and Alberta Place Suites Hotel were targeting? I don't think this one needs a re-clad, unless it's for efficiency purposes. A good pressure wash and then pump those dollars into street level remodelling, and I'll be happy. It will definitely get podium level updates and a good cleaning. We will release our renders in a few months time. Overall this is one of the nicer older towers but definitely some podium updates would be really nice to see. Ideally it would be really nice to see some better interaction with the sidewalk, even as simple as not having all the windows curtained off. More people living/staying right on Jasper is fantastic. Excited for updates. Awesome! Looking forward to those! This must be away off as one of my clients is moving offices to this building due to renovations in another AIMCO owned building they lease in. The conversion will start this summer. Interesting. My client only has a small footprint, so perhaps they are able to do the conversions while there's still office tenants on other floors? Or the conversion is only taking up part of the building? I literally just had this office move come across my desk last week - to take place in June - so very curious. Not good in the sense there wasn't enough absorption for the office space, requiring them to convert the unused space to hotel space. Good in the sense will bring in out of towners who disproportionately spend more money and time on the streets - I suspect the core will benefit. How does one retrofit per-suite washrooms into what was per-floor washrooms in a conversion like this? Could this be in another Enbridge building? There's the new one with the Enbridge name, but before that there was this one and one other. I don't think it would make sense for them to take new office clients if they're going hotel. But then there's the Financial Building going residential on some floors and not on others so who knows. Marcel is your guy for this answer, but with a ton of coring and a lot of new piping. A significant portion of the mechanical systems in a building like this would have to be ripped out and installed new. Depending on how old the systems are, in some cases, basically everything will need to be replaced. And often you'll even need new services for water and drainage, given the significantly different usage and demands. It's not simple, that's for sure. It'll be interesting to see what becomes of the "attic" in the peaked portion of the building. There's some serious potential there for something extremely unique, if it can be made to work. Yes, after talking with my client and a PM with Alambie, my client is moving to Enbridge place, not tower. i'm excited about this project and it's positive impact on the core both for the reduction in office vacancy and the additional use/activity that will take its place. i'm even more excited to read about a permitting and approval process that will allow the conversion to start this summer! any chance you could share the process with the rest of us? Last edited by kcantor; 05-02-2018 at 05:27 PM. At the Ten (a 70's era commercial bldg), the washrooms are raised to allow room for plumbing. Wow! That is a very nice exterior re-do! That did not look like a redo of the building to me. It looked like a new tower beside the old place. Sure does. It looks like it might have been from a couple years back when landlords and developers were competing to be Enbridge's new location. 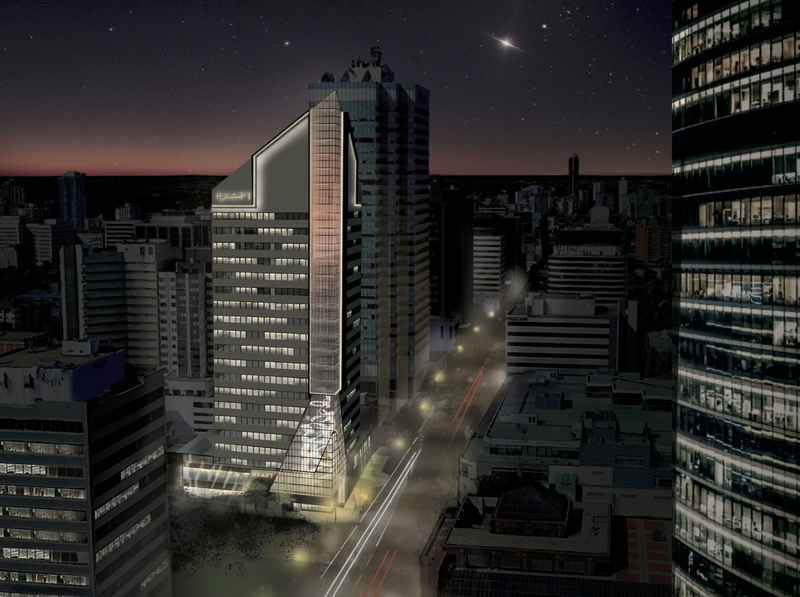 Looks like an interesting proposal, and I like Manulife II in there too. Odd that the description is that it's residential, because it sure doesn't look it. Yup, you're right. Jumped the gun on that one. It was Procura's offer to the Enbridge RFP. I didn't realize there was a space on top. I thought it was just an enclosed point. It's just an empty space as of now, yes. Stay tuned tonight for a story on the former Enbridge tower on Jasper/102st. FYI Vinesh Pratap is doing a piece for Global Edmonton. Vinesh will absolutely crush this story. Look forward to it. Just a picture of my tv screen, sorry for low res. ^Great addition to Jasper, especially opening up the ground floor. An interesting project. It may well cancel out the building of a couple of new hotels though. 70 mil is a lot of dough to spend on this building. Will definitely be high end. i think that was total project value and not hard construction costs being spent on the building but even so that comes to almost $350 psf which should include enough for hard construction - even if it’s half of the total - to make for a very nicely done project if it’s spent well. for comparison, new hotel hard construction costs would probably be in the $350 - 450 psf range with something in the jw marriott niche even higher than that. Last edited by kcantor; 03-06-2018 at 10:37 AM. Other hoteliers with a lower room rate point won't be concerned. And I am not sure the Lighthouse are currently managing a high end hotel like the Le Germaine chain (as an example) and competitors may not be distracted by a local independent hotel without the clout of a chain to fill the rooms. From the Lighthouse webpages they appear to indicate they offer a suite of management services - but indicate only one (1) Hyatt property in the Edmonton West End and its the lower end Hyatt Place. That said, I wish them luck and hope they develop a top notch property and it is successful. You’re definitely the guy to ask, how does a developer go about protecting themselves from unforeseen issues in repurposing a building? This may be an oversimplification, but I’ve experienced household renovations gone amok because of the things found behind the plaster and it really drove the final price up on me. Is it less about capital cost and more about the potential headache that some of our towers aren’t getting repurposed? Because at that price per sq foot, and the increasing demand for hotel rooms in the city, it seems economically viable to repurpose some of our office space into hotels rather than to build from new. Last edited by Stevey_G; 24-07-2018 at 10:21 AM. it’s a question that reminds of that old maxim... do you know how to become a very successful small developer? you need to start as big one. i think you can protect yourself from most risks by identifying them and then allowing for them in your proforma, even for the unknowns. the more you don’t know, the more of that you have to do. as examples, you may end up with a construction contingency (or more than one if you know enough to identify more than one area where it’s approriate such as foundations or environmental or demolition etc. ), one or more design contingencies, interest rate risk, foreign exchange risk if your investors aren’t all canadian etc. of course the risk in the above is to do it and still have a viable project. while you can control or manage your costs like this, your revenue will be fixed by what the market will pay when you’re done, not what you need to make a profit. too much safety will just mean not doing a project because you won’t be able to finance it. Last edited by kcantor; 28-07-2018 at 09:20 AM. My dad tried a few businesses including the developer/builder thing. And a silent partner thing in a manufacturing business. In both those cases unrecoverable partner debts were the unexpected risks that ultimately doomed the businesses. A manager running up a demand lian/line of credit after the partners said don’t do that was one initial surprise when the bank called the loan and seized the assets with zero time to cover. However he was always proud to be able to say he built the closest new apartment building to the downtown at the time. And the houses he built are still standing. Last edited by KC; 28-07-2018 at 09:33 AM. Yeah, Pa_Dawg always said to go it alone. And never do business with a friend. Unless of course you want to lose both the business. Pa_Dawg was handing out sage advice when he said that. 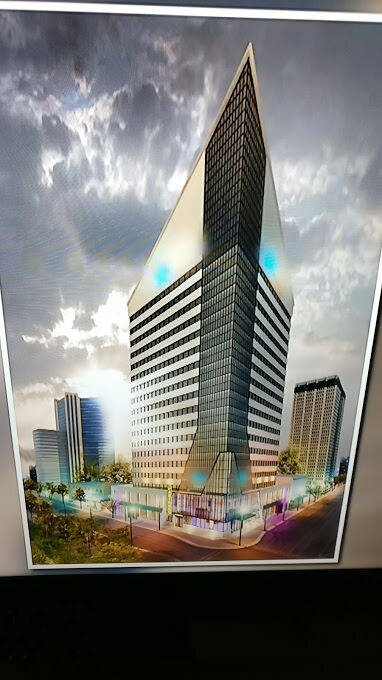 Renovations are underway on the former Enbridge Tower with reservations not far behind as the 23-storey building begins development into a downtown hotel. The office building on the corner of Jasper Avenue and 102 Street, known for its peaked roof, was purchased by Edmonton-based Lighthouse Hospitality Inc. at the end of April. The redesign is expected to cost around $65 million to $70 million and take 18 months to complete, Lighthouse president Paul Aulakh said in an interview Friday morning. His proposed plan includes two separate hotel branches, with about 300 rooms, run under one chain. One hotel will offer the traditional short-term stay and the other will be geared toward extended stays, something Aulakh said is lacking in the downtown core. Several prominent hotel brands have been in discussion with the developer, including Hyatt, Marriott and Delta. The outside structure will mostly remain intact, Aulakh said, but with plans to open up the main floor front to Jasper Avenue and 102 Street with glass windows. As for the iconic peak, it will remain in place with plans to project LED lighting. “It stands out as it is, but it’s really going to stand out once we’re done,” he added. For the first couple of floors, Aulakh said the idea is to include restaurants, a spa, gym, and all the amenities traditionally found in a hotel. They are also in talks with a brewery and other food concepts, he said. A three-level underground parkade will remain, which Aulakh said is a treasure to have in the downtown core. Above the extended-stay hotel rooms, Aulakh said the top few floors will have apartments for rent geared toward people who like the downtown spot and are interested in having these extra amenities attached to the hotel. Now that the work is underway, can the thread title be changed to something else? Interior demolition is still ongoing. However, they are leaving the front lobby as-is for now. Lighthouse Hospitality has a website worth eff-all plus no social media I can gather, so I hope there's another way of finding out how their hotel is coming along. I've seen lights on in the tower which is a welcome sight to see, progress I guess. I was starting to think it would sit vacant due to the surplus of office space available, good that its getting a new lease on life. Last edited by Kreation; 11-11-2018 at 03:31 PM. Nothing confirmed, but that is one of the brands rumoured. I would imagine the other hotel is a related brand such as Hyatt Regency. After all, it wouldn't make sense to have two competitors in one place. Agreed. But Hyatt has taken a beating on its image on the Quarters hotel and they may have set a higher bar for local first time operators in this market to reach before agreeing to use of franchise name. That said it will be interesting to see what happens. The developer/owner of this tower has a Hyatt in the west end. I am aware - but it was self constructed ... my point is Hyatt will be looking for quality products and solid operators. That’s not to say there will be an issue securing Hyatt branding from this family run business ... just heightened scrutiny. The old Enbridge building conversion into a Hotel is branded as a "Hilton DoubleTree Downtown Edmonton." That's for one of the 2 hotels at least, dunno about the other. Source? Source is a buddy who says there is a job posting on Indeed with all of the details....."255 rooms." So I am assuming that is the entire building? So maybe only 1 brand? My understanding is that it will be an overnight hotel along with a longer term 'suites'. Few extended stay brands out there. Great for downtown! It's the Quarters hotel that's being rebranded as a DoubleTree, not the Enbridge. I got curious and looked on "Indeed" and there was a job posting for a front desk clerk and the location given was: Quarter note hotel to be DoubleTree soon". So there's still a very good chance that the Enbridge will be branded as a Hyatt. If the SOB owner couldn't maintain Hyatt standards, no way in hell he will maintain Hilton standards. This is the link I was referring to. Now that the former Hyatt Place will be a DoubleTree, any word on the branding of this particular hotel? I believe that we could see a bit of a flip here. Last edited by EdmTrekker; 16-01-2019 at 10:13 AM. Exciting brand new Hyatt House Hotel under construction in Edmonton’s Downtown Core. ^ Hyatt House is the long term stay brand. I would wait for an official announcement for the short term stay brand. They are aiming for two brands within the building. My guess is that they would do around 100 - 150 rooms Hyatt House and the rest would be short term stay (maybe Hyatt Centric, Hyatt Regency). Wow, what great news and reuse! 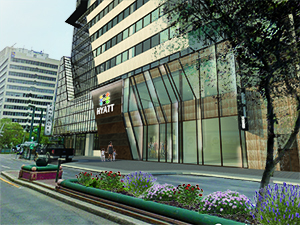 Logo on the image facing Jasper suggested Hyatt Place, but could just a placeholder. Elevators #1-3 labelled HYATT, #4 labelled RES, #5 labelled SHARED. Interesting split - with #4 and #5 being in a secured hall. ^Good catch, just seeing that now. this project is looking quite promising. Also an indication that there will be a full service Hyatt onsite. Hyatt Place is confirmed. There will be an article likely tomorrow in the Journal. 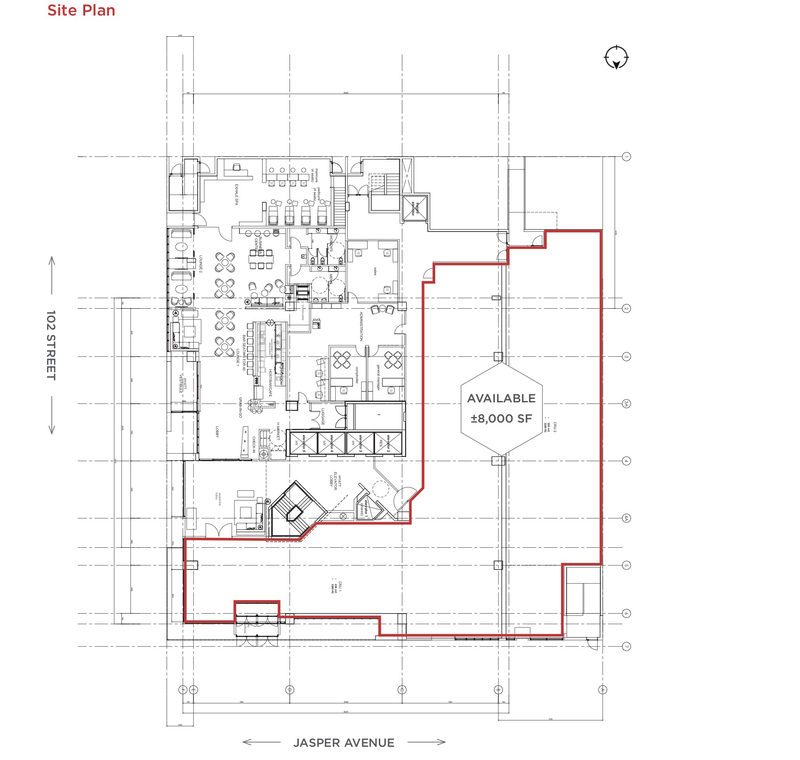 "full service Hyatt onsite" ... not from the look the floor plan in the realtors website. Its showing as having no real lounge - simply a juice stand counter. As to the Exhale Spa - this will be Hyatts first Canadian location according to the website list of locations ...but the floor plan shows toes and nails only and not the extensive services stated in the other location. Last edited by EdmTrekker; 16-01-2019 at 05:11 PM. Short-term stay will be a Hyatt Place. What's up with the Pantages sign in these renders? The main floor plan has a full service lounge. Very interesting.....It would have been nice to have a full service Hyatt. I guess the market for higher end travelers is a bit tough with the JW coming online soon. Either way, Hyatt Place is really good especially for mid-range (but good quality) rooms downtown. Hyatt House is a very nice concept and will fill a niche market downtown. This is a great, great addition to Jasper. Was quietly hoping that, this building would have attracted the W hotel brand, but not sure that we are big enough for that. This building just seemed so similar to the W in LA in terms of adapting an office building. Yup, they show it as being the NE instead of the SW corner. Not a biggie but you'd think that they'd get it right. I'm just glad the building and corner will be reactivated. As a throwback it would be cool if they name their on-site restaurant Pantages or something to tie in. Love this project and can't wait to see more tourist foot traffic downtown.